“Cast-Conditioned Ale at Kalispell Brewing Co!” – congrats to our winner Matt! We will be sending you an email so you can claim your prize. Thanks to all our entries — love that we have witty readers to the blog! So here’s the deal. We want to show Maggie the Beer Ambassador some love. With a broken arm and an almost open brewery she’s got a lot on her plate. The most creative photo caption left below in the comments wins a free t-shirt from Kalispell Brewing Company. Like the Cou Cou Studio Facebook page if you feel extra kind. The contest ends at noon on Valentine’s Day. Show some love! Be creative! Share with your friends. Thanks to Kalispell Brewing Company for generously donating the t-shirt we are giving away. It’s super-soft and adorable. Plus it promotes some damn good beer! February 11, 2014 - 2:22 pm	Ned Hayes - Broken Arm Porter -- not for the weak or the wimpy! February 11, 2014 - 5:18 pm	Kirstin Gallien - Come drink with us. Just one arm required. February 11, 2014 - 7:18 pm	ed wallace - It'll put a spell on you. February 11, 2014 - 7:46 pm	Jesse - Is it cold in here or is it just my beer? February 12, 2014 - 3:05 am	Peter "Denmark" Bavngaard Thrane - All's well that ends well. At least it wasn't my drinking arm. Cheers! February 12, 2014 - 7:25 am	Barb Triplett - Visit Kalispell and "Cast" All Your Worries Away! February 12, 2014 - 12:55 pm	Debbie McGuiness - Take a break at Kalispell Brewing Co.! February 13, 2014 - 2:55 am	Gabriel - "I'd gladly pour you a beer if I wasn't drinkin this one." February 13, 2014 - 5:36 pm	Nic - Kalispell Brewing, just what the doctor ordered. February 13, 2014 - 5:44 pm	Ralph Hopkins - Go ahead TAKE my beer if you can! 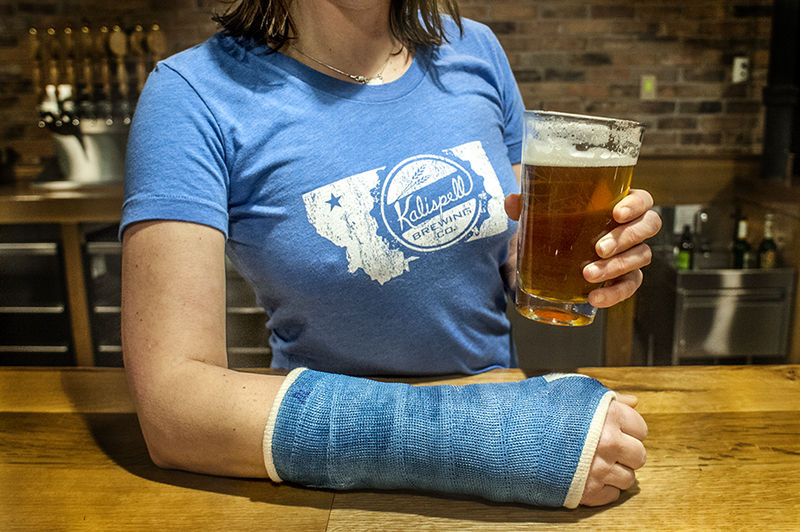 February 13, 2014 - 5:54 pm	Cam Bond - Nothing cures the broken arm blues, quite like Kalispell Co. brews! February 13, 2014 - 6:01 pm	Jeff von Kiper - I don't always wear a cast when I break my bones, but when I do, I always make sure it matches what I am wearing. February 13, 2014 - 7:10 pm	Robbin - Arm wrestle for a beer..? February 13, 2014 - 7:53 pm	Matt - Cast-Conditioned Ale at Kalispell Brewing Co! February 14, 2014 - 10:03 am	greg myett - These are a few of my favorite things! February 14, 2014 - 11:02 am	katie - Though she suffered a broken wrist wile crushing her opponent in the arm wrestling competition, when asked she says, "winning this stellar pint was totally worth it!...and you should see the other guy." February 14, 2014 - 11:14 am	Rachel Burke - What a brew-ser!!! February 14, 2014 - 11:20 am	Michael Boh - Thank goodness I only broke one arm! February 14, 2014 - 11:33 am	Caralyn - And you thought I was right handed...suckers!